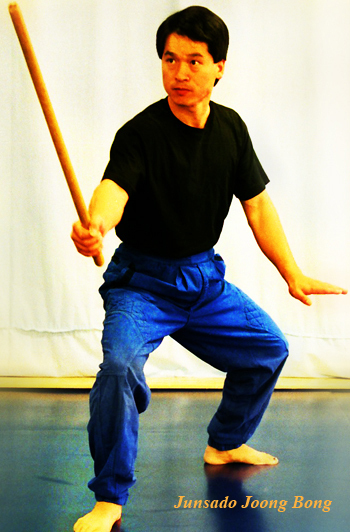 The Joongbong, or short stick, is the most versatile and easy to learn weapon. Once mastered, the principles of the Joongbong can be applied to any blunt weapon. The most comfortable length for the Joongbong is the length of your arm from the armpit to the middle fingertip when you stretch your arm out with your fingers fully open. Grip the Joongbong approximately one to two inches above the end. The tip of the Joongbong aims at the eyes or the Adam’s apple of the opponent with your arm at almost a 90 degree angle to the Joongbong. There are five different blocks: high, cross, inside, outside, and low block. There are five offense skills: straight strike, thrust, inside cut, outside cut, and cross cuts. There are five footwork: forward, backward, two lateral steps, and turn step. If you want to learn how to use the Joongbong properly, the Joongbong Fundamentals and Patterns video is a good place to start. Joongbong Fundementals include stances, grip, footwork, offensive skills, defensive skills, and the correct way to evade, cut, strike, thrust and block with the Joongbong against an opponent. Sang H. Kim thoroughly explains every step of the training as you follow along. Joongbong Patterns are three forms of Joongbong combat with applications and step by step explanation. Beginning from the most basic skills introduced in Joongbong Fundamentals, you will learn how to integrate your techniques into a flowing pattern of offense and defense. Each new pattern introduces increasingly difficult combinations of footwork, attack and defense to upgrade and refine your weapon skills. Like this article? Learn more about the joong bong by watching the Joong Bong Fundamentals and Patterns video (also on DVD) and the Advanced Joong Bong Video (also on DVD). This entry was posted in Weapon Training and tagged article, joong bong, joongbong, short stick, stick, weapons. Bookmark the permalink.